How do you control your virtual reality experience in Valve and HTC's sensor-covered Vive VR headset? With a pair of sensor-pocked motion controlled wands, of course. They look weird, bulbous and exactly like what they really are: early prototypes. Their current form is so early, in fact, that the HTC folks at Mobile World Congress wouldn't even let us photograph them. Valve's GDC team was less cautious—but the controllers were still protected by a thick cube of display-glass. Like the Vive, the controllers are peppered with sensors. At a glance, they're ugly—but event staff promised me that was going to change for the final version. Step one, they told me, is getting the technology right, and apparently this is right. 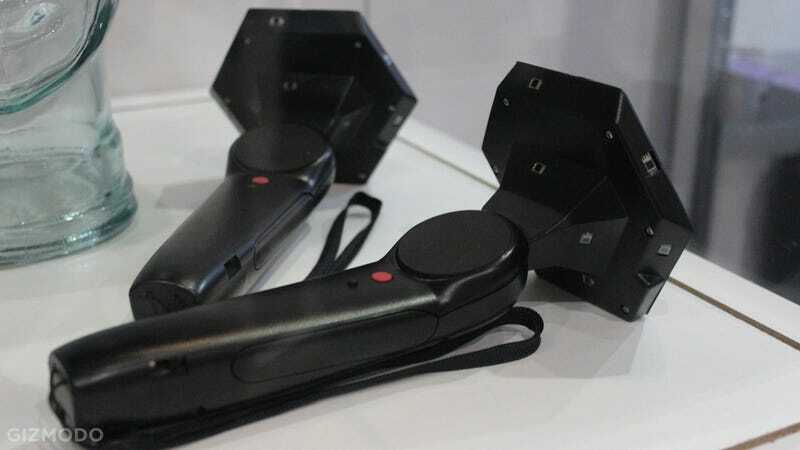 I won't get to try it for myself until tomorrow, but Gizmodo staff at MWC seems to agree: Valve has cooked up a pair of VR wands that actually do the job. The controllers (and the headset itself) are tracked by these two blocky wall-sensors. These too, I'm told, will get significantly smaller (and more attractive) before the consumer release. I, for one, like their cobbled together look. It looks like the future. The final version of Valve's Steam Controller doesn't look quite as alien, but it's still pretty futuristic. It's the vision of the leaked mock-up art we saw a few months back, keeping both of its fancy, tactile touchpads while adding in a traditional analog stick and four face buttons. Holding it feels good. The stick has a soft, but springy resistance and the buttons all feel pretty standard. The touchpads seem a little revised—they're smoother than the surfaces used on Valve's earlier prototypes, and the lefthand pad now features the outline of a traditional D-Pad. There are shoulder buttons and triggers, naturally, and the toggles on the controller's bottom don't feel as cheap as they did in early prototypes. This thing could actually be pretty good, depending on how games utilize it. Sadly the Valve team's wouldn't let me try it out for real, repeating their mantra: "Tomorrow," they said. "You have an appointment tomorrow, right?"